Many of our dishes contain allergenssuch as egg, gluten, dairy, nuts, peanuts etc. Please ask about your meal when ordering and we will be happy to advise you. Free vegetable side dish on all orders over £20. Cannot be used in conjunction with any other offers, promotions or discounts. An exotic dish which our chef recommends. All dishes are cooked with garam masala, fresh herbs and ground spices, green chilli garnished to give that spicy mouth watering taste. To add extras simply click 'Select Extras' in your cart. Mouth-watering dishes cooked with minced meat & green chillies, fresh coriander, onion & a mix of exotic herbs & spices. To add extras simply click 'Select Extras' in your cart. Pieces of chicken or lamb, prepared in a special blend of fresh coriander relish sauce with a slight infusion of garlic & ginger. Very popular dish from Jaipur. Marinated chicken grilled in the tandoori oven & cooked with fried mushrooms, fried onions & capsicum with fresh Punjabi masala in a thick sauce. Hot & very spicy to taste. Steam cooked in a hot chilli garlic sauce & garnished with coriander. Marinated chicken tikka pieces, cooked in a creamy sauce, flavoured with mixed nuts. Medium dish, a beautiful combination of spices, tamarind sauce, mushroom & onion. Whole chicken breast barbecued & cooked with minced meat to give a medium hot taste. Tandoori chicken cooked with minced lamb & spinach in a medium hot sauce. Cooked with chicken tikka & a maximum quantity of onions, medium spices & topped with cheese. A very exotic dish. Cooked with cottage cheese & medium spices. Minced meat cooked as a kebab roll, fried with garlic & potato to provide an aromatic tasting dish. Tandoori king prawn, chicken tikka, lamb tikka & spiced with garlic, ginger, tomato puree & then cooked with onions, green pepper, tomato & spiced with potato. A special Bangladeshi dish cooked with a very hot, aromatic chilli which gives this dish a hot & spicy taste. Sweet & sour sauce with onions & peppers. Chicken tikka marinated in a thick, sweet, creamy sauce with mixed nuts. garlic in a fairly spicy dish. Cooked with fresh green chillies, fresh coriander, chopped onion, peppers & garlic in a fairly spicy dish. Lamb pieces marinated then barbecued in the tandoori, cooked in a sweet & creamy sauce with mixed nuts. Mild. Tender chunks of chicken or lamb with honey, sweet mango & fresh garden mint with spicy potatoes in a medium thick sauce. Diced cubes of chicken tikka or lamb tikka with fresh garlic and ginger with chunks of onion and peppers with aromatic chillies in a slightly hot sauce. Cooked in the tandoori oven then cooked in a rich sauce. Marinated lamb cooked with fresh tomato & mixed nuts. A mild & creamy dish. Marinated chicken cooked with fresh tomato & mixed nuts. A mild & creamy dish. Tandoori & tikka dishes are not curries. They are marinated in yoghurt, fresh herbs & special tandoori spices for 24 hours. Then cooked in a clay oven which is fired with charcoal. All dishes are served with fresh green salad & mint sauce, their taste is deliciously sensational & defies description. To go with meat and perfect satisfaction try our vegetable side dishes or naan. To add extras simply click 'Select Extras' in your cart. Tandoori bhuna masala. Cooked in the tandoori oven then cooked with minced meat, herbs & spices to give a medium hot taste. To add extras simply click 'Select Extras' in your cart. A bhuna dish has been cooked in the most selected herbs & spices with tomatoes, onions & capsicum, to provide a dish of medium strength, also one of the most spicy dishes. To add extras simply click 'Select Extras' in your cart. Chicken, meat, vegetable or fish cooked tenderly with basmati saffron coloured rice. Delicately flavoured in spiced ghee. Garnished with herbs & spices. Served with a side portion of vegetable curry. Why not try 2 dishes at once? Choose any 2 dishes to create your own combination. Please write your choosen dishes in the comment box, thank you. Anything extra can be added to these for an extra charge. To add extras simply click 'Select Extras' in your cart. The basic curry is a sauce of medium consistency produced from a wide range of spices, giving a standard taste of curry. A medium dish, fairly dry, garnished with tomatoes & onions. These dishes have a maximum quantity of chopped onions, a very suitable dish for those who prefer a sweet to medium taste. A beautiful combination of spices & herbs, consisting of lentils, pineapples, garlic & lemon, producing a tantalising dish. Medium to hot curry, similar to basic curries, also cooked with selected spices & herbs, garnished with freshly selected mushrooms. A sweet & sour, medium hot flavoured curry with a blend of herbs & spices. Most suitable for beginners, a delicate preparation of sliced almonds, coconut powder & cream, producing a rich mild creamy texture. This dish has a medium taste. A typical combination of central Asian & Indian spices, egg & tomatoes, prepared with rich spices. This dish has a medium taste. Medium hot dish with selected herbs & spices, garnished with spinach. Another popular dish of South Indian origin. A rich, hot flavoured taste extensively prepared with garlic, red chilli & tomato puree. A very hot dish, only for those who can tolerate intensive spices. Onions, green peppers, tomato, garlic, ginger & an array of spices cooked in a succulent sauce. All the following dishes are served with fresh salad & portion of chips. Served with salad & mint sauce. Add extra cheese, chicken, lamb or seekh kebab for £1.50 simply click 'Select Extras' in your cart. With tender chunks of chicken tikka, salad & mint sauce wrapped in naan. With seekh kebab, salad & mint sauce wrapped in naan. With chicken tikka, lamb tikka, seekh kebab, salad & mint sauce wrapped in naan. Served with salad & sauce. Comes with chips & a can of Pepsi. Stir-fried with onion, mushroom & spring onion. Leavened bread, plain or with desired stuffing cooked in tandoori clay oven. To add extras to your bread simply click 'Select Extras' in your cart. Poppadoms - onion salad - mint sauce - onion bhaji - chicken bhuna - vegetable bhaji - plain naan. 2 poppadoms - onion salad - mint sauce - chicken tikka - samosa - chicken balti - vegetable rogan josh - saag aloo - pilau rice - keema naan. First time user, very good experience. Arrived earlier than expected. Courteous, friendly staff, food remained hot and was correctly packed for delivery. Delicious food which we all enjoyed Immensely. Will definitely use again and recommend you try also ð??? I always order from here , food is fantastic with quick delivery and very friendly service. Would highly recommend. Always have a fantastic curry from here and love the size of nan bread! Try cheese and paper nan! Donâ? ?t use any other Indian takeaway at its the best!! Thank you guys. 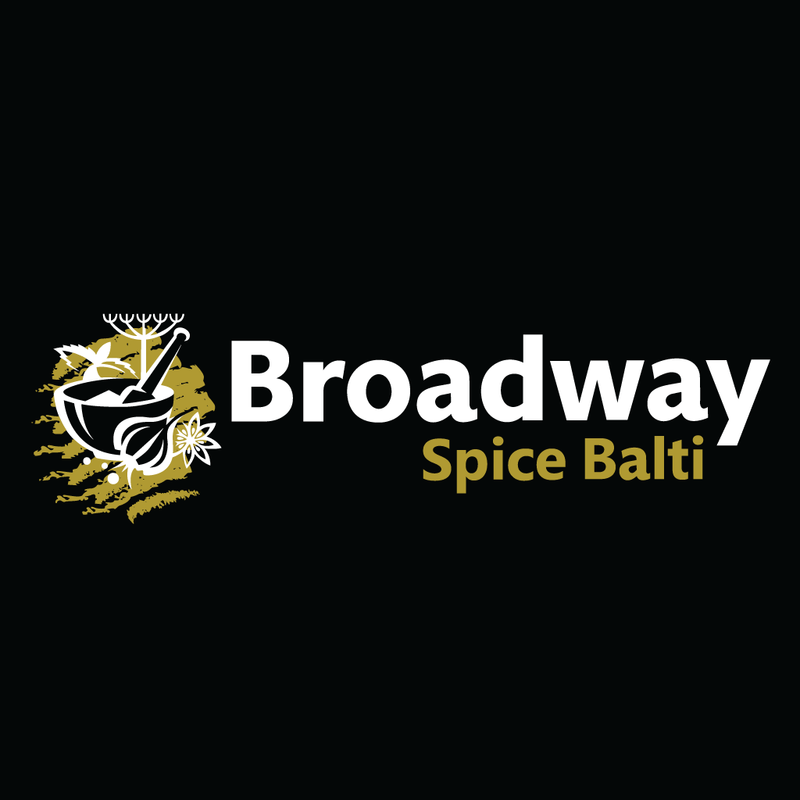 Used Broadway for years, good food, good service, good price. Lovely food, excellent service, highly recommend! Great food, great prices, excellent service, this is the only Indian takeaway we use. Food is fab! Thank you again . Great service, great food, very friendly staff!! Highly recommend ð???ð???ð??? Great food as usual and always fast delivery. Ordered from here for 4 years. Best currys, always warm on deleivry, pleasant staff and quick delivery service. Would not go anywhere else. Definitely recommend. 5 star!!! Food was lovely and the service was fast! Excellent meal as always pleasant guys and prompt delivery excellent value for money would highly recommend. Always delicious, Korma and jalfrezi. Friendly delivery and great value for money .